Ancient Inscription Museum is located at Tanah Abang Street 1, Central Jakarta. The piece of land of former Dutch cemetery called Kebon Jahe Kober has been arranged to be a shaded and green garden with various kinds of tropical plants grown on it, and has become a place of intensive supports for both artistic and historical values. 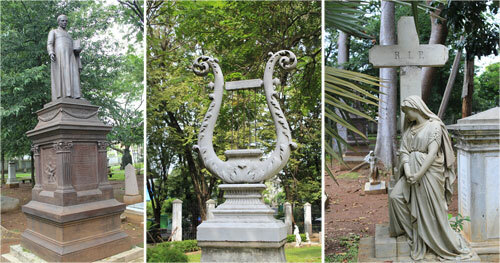 This land was designed as cemetery for the Dutch, especially for officials and important prominent figures. After Indonesia gained its independence, this land was still used for the public, especially by Christian people. Since 1975 Kebon Jahe cemetery was closed, and by seeing the existing potentials, preservation and rearrangement of the selected inscriptions and gravestones were performed on that land of 1,3 ha. On 7 July 1977 the DKI Jakarta Governor Ali Sadikin, inaugurated pat of the land of the former Kebon Jahe cemetery to be an Inscription Museum. Knowing the inscription would mean to know the works of talented designers, painters and sculptors cast as a materialization of deep expression of the people who gave the order or the users, because as if inscription was able to talk on what we need to know. This Museum displays gravestones from various Dutch names and prominent figures like Major General J. H. R. Kohler, Dr. W.F. Stuterheim, Dr. F. Roll, Pieter Erberveld and others. There is a row of other names like Olivia M. Raffles, Miss Riboet, Soe Hok Gie and others who was berried or moved to this location since the 17th century until the 1900s.